Picking a theme will help you to start the planning process! You can go with a winter theme like a winter wonderland, a decade party, or a TV show party (decorations from some of your favorite TV shows, have guests dress up like a character from their favorite show)! When having an indoor party it may be helpful to create a schedule and do your best to stick to it! This will help to ensure there is enough time for all of the snacks, games, etc. This will be super helpful if you are planning a party for kids to make sure they stay occupied and keep things moving! 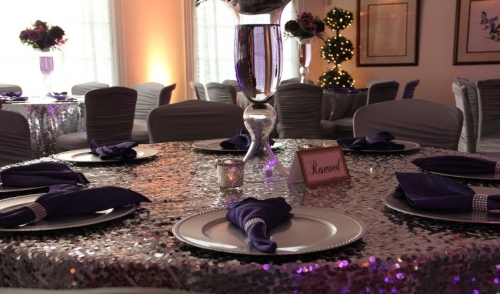 Once you have chosen a theme you can add all kinds of decorations to help enhance it! For winter parties taking place indoors, it’s fun to choose a theme that can also be applied to a snack or game! Better yet – why not combine both? For a creative party idea, why not choose a “Cake Boss” theme? You can rent high cocktail tables that each have a cake ready to be decorated on them! Party goers can decorate the cakes as an activity and then enjoy them for dessert! Depending on the theme you choose, you will probably need tables, chairs, utensils – the works! Renting these types of items will help to save cost and avoid the hassle of storing these items until you need them again! It’s cold outside so try to bring some warmth to the party with food! The good thing is you have a lot of room to get creative with a winter party menu! A new trend we are seeing this year is hot chocolate stations at parties! You can rent everything you would need to set this up from the table, to the utensils, to the beverage utensils for hot water! Renting a chocolate fountain is a major crowd pleaser! You can have a variety of foods available for people to dip including bananas, marshmallows, strawberries, pretzels, etc! Also, consider setting up a buffet table to make sure you have a lot of variety for those picky eaters! Renting a photo booth is always a fun idea for guests! You can have props ready and waiting for guests to use! Consider matching the props to the theme that you are having! Having the guest of honor do their best to get in a picture with each guest helps to make a really personal thank you card! You can have a photo card created or simply include a photo in the envelope with your thank you note! © 2019 Taylor Rental Center of Enfield, CT. All rights reserved.